Are you searching solution for Razer Synapse not working on Windows 10? Then you are at right page. If you are a big fan of Razer synapse, then you must have experience of Razer keyboard and mouse. The products by Razer are versatile as well as reliable, too. 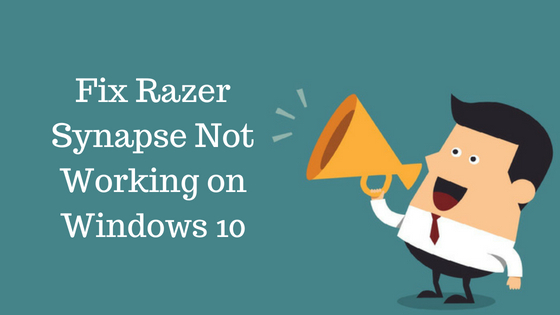 However, it also happens that sometime you may face some errors and problems related to Razer Synapse not working on Windows 10. If your razer synapse not working then you are not only one, like you many users also face the same problems. From now stop worrying, as you are at right place to get a solution for the problem Razer synapse won’t open. If you are a gamer and you are facing a problem of razer synapse not opening, then I know it frustrates you. You can’t connect your mouse and keyboard to your windows pc/laptop and hence not able to play games. So here are some quick fixes to solve the error razer synapse not detecting keyboard. Razer Synapse helps you to manage other Razer devices. Moreover, one of the primary reason behind this error is corrupted, faulty or missing drivers. So first download and install the correct version of Razer Synapse Drivers for Windows. Other effective fixes for Razer synapse not detecting mouse are given below, check it out! Before we move to the solutions, first let’s discuss on Razer synapse won’t open windows 10. It is possible that any of your Razer devices are corrupted or outdated, then there are chances of not working it. Here is a step by step guide with all the necessary pictures to help you in razer synapse won’t open issue. After reading the title you might ask us a question that how to uninstall Razer synapse, but do not worry read this fix and at the end, you will find the answer. Step 1: Press Windows key and R key together to open Run command. Type devmgmt.msc and press Ok or hit the enter key. Step 2: It opens Human Interface devices, expand it and click on Keyboards. Step 3: Find Mice, and other pointing option and expand it. Step 4: You find Razer devices, right click on it and select Uninstall option. Step 5: Next, from the Cortana or search bar go to Programs and choose Apps and Features. Step 6: Select Razer Synapse and click on the Uninstall. Step 7: Now from the system, unplug all your Razer devices and after 5 minutes plug them back. Now, windows install your Razer device’s drivers. Your Razer keyboard and mouse starts working again. What you need is download and install it again! Simple, isn’t it? Step 1: From the above method uninstall Synapse and then delete all old files. Step 2: Now, download Razer Synapse, and then install the software. You need to connect Synapse to the internet. Step 3: Next, click on Razer Surround and select cancel. Do not choose the update option. Step 4: Restart your PC and check your problem is solved or not. Sometimes firewall or antivirus also cause razer synapse unable to update problem. To check that your firewall/Antivirus are culprits behind this error, try to disable it and check your razor devices are working properly. If they are working then, uninstall the antivirus and use another one. Remove the old version of Microsoft .NET Framework and reinstall it. It surely fixes the razer synapse not detecting. Step 2: Open the downloaded software, follow the on-screen instruction to install it. Step 3: Run it and click on the tab of Scan Now option. Step 4: The software scan your whole system and find all the faulty or old drivers. Click on download tab and all done! Go to synapse properties >>Compatibility >> run a program with windows 7. Same as above but open it with admin, and no antivirus is running with it. It is all about Razer Synapse Not Working on Windows 10 fixes. Hopefully, you get a solution to your problem regarding razer synapse update. In case, you meet any error or face problem, use the comment box. We will surely help you. Thank you! How to Solve Taskbar Not Working Windows 10? How to Download Mobdro for Windows 10?